I decided to give GNOME Shell a try. The GNOME Shell redefines user interactions with the GNOME desktop. In particular, it offers new ways for the user to find and open applications and documents, switch between various activities, and view incoming information such as chat messages or system notifications. To say that I love it would be an understatement. It's exactly the sort of user interface innovation I was hoping would happen in the Linux world. What I like is that it isn't just eye candy. Instead of just being a badly done knockoff of Windows or OS X, it's new, clever, and interesting. It simplifies my desktop, while at the same time making me more efficient and powerful. Here's a cheatsheet that explains all the features, in case they aren't obvious. Here's how to install it on Ubuntu. I did have one problem. If you switch to GNOME Shell completely, your mouse may disappear when you click the Activities button. Remember, this is still a preview release of GNOME Shell, so bugs are to be expected. The simplest way to fix this issue is to type Alt-F2 and then "restart". Using Alt-F2 and "restart" also helps if you switch from your laptop display to an external display, and they have different resolutions. I tried Gnome Shell with Karmic running in a VM Player. It's very sluggish. From the very low frame rate I seem to have, it looks like it only uses OpenGL, right? I'll try that on a real install later. Thanks for pointing this out. It looks nice. After watching the screencasts, I'm still wondering if and how it handles multiple instances of the same application. Some apps you only want the one instance, other apps multiple instances might be preferred. Is it easy to find and switch between the multiple instances? Related: how well does it handle the GIMP with its multiple windows? > Is it easy to find and switch between the multiple instances? Yes, there's intelligent handling for apps with multiple instances, especially when you hit Alt-Tab. > Related: how well does it handle the GIMP with its multiple windows? It's not a tiling window manager, so there's less to go wrong. I just tried it out, and it handled the GIMP perfectly sensibly. Yeah, sorry about that. I just deleted it. > I tried Gnome Shell with Karmic running in a VM Player. It's very sluggish. From the very low frame rate I seem to have, it looks like it only uses OpenGL, right? I'll try that on a real install later. Yeah, I wouldn't use it on VM Player. 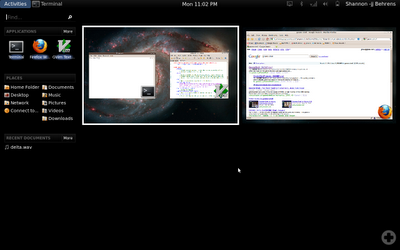 If I were going to use VM Player, I'd use OpenBox or Xubuntu or something like that. I got tired of waiting for VMWare Fusion, which is why I installed Linux natively on my MacBook. Since I have a MacBook with 2 cores and 2 gigs of memory, I've been playing with things that can actually make use of all that hardware in a useful (not merely wasteful) way. I think GNOME Shell does. I.e. it's not just eye candy, but is actually pretty useful. > Thanks for pointing this out. It looks nice. Oh wow! I haven't played with GNOME Shell in a while, so I never thought of using it with Dart. In theory, it should indeed work with clever use of JS interop.